This project develops teleimmersive technology which enables users to collaborate remotely and experience the benefits of a face-to-face meeting in a virtual environment. 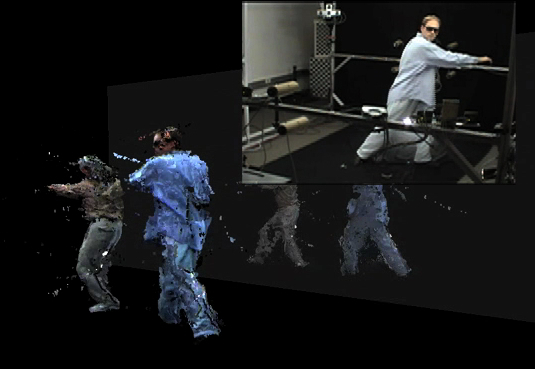 Using a multi-camera setup, the immersive technology creates an accurate, full-body 3D reconstruction in real time, which is sent through the network to the remote location. Geographically distributed teleimmersion users can meet in a virtual space which can also include different synthetic objects or data that the users wish to interact with. Examples of teleimmersive applications include 3D video conferencing; collaborative work on 3D data sets such as medical (MRI, 3D x-ray), scientific (i.e., geological), and design models (e.g., CAD and building designs); remote training (e.g., oil rigs, military scenarios); distance learning and remote teaching of physical activities/skills (e.g. in rehabilitation, dance performance); interactive gaming; and advanced social networking. In contrast to existing videoconferencing or collaborative technologies, teleimmersion is able to humanize remote communication by fully immersing users inside a common virtual space. The teleimmersion apparatus consists of 48 cameras which are positioned in somewhat circular arrangement to cover 360 degrees. The hardware architecture of the system allows simultaneous capture of images on all cameras. Several servers run the stereo reconstruction algorithm allowing for full-body 3D reconstruction of user(s) inside the space with 15-20 frames per second (FPS). The data is delivered in real-time over the network (using internet 2) to a local display or to a remote location. the project has made significant improvements in the calibration (localization) of cameras, 3D reconstruction and graphics. The teleimmersion technology has been demonstrated in several areas. In remote dancing experiments, dancers have connected between Berkeley, CA, and Urbana Champagne, IL, where they practice and perform live on several occasions. Successful collaborative interaction has been demonstrated with a virtual object between two researchers in Berkeley, CA, and Davis, CA. The teleimmersion technology has been used in collaboration with Stanford University to evaluate benefit of using immersive environments for learning physical activities, such as Tai Chi. In collaboration with UC Davis the project has implemented visualization and manipulation of medical data within the teleimmersive environments which could one day allow doctors to meet in the virtual space and discuss surgical procedures. The project is making progress towards the feasibility of a low-cost portable system which could be in the future used in the office or even at home. This is possible with simplification of camera setup and calibration, robustness of the algorithms, and compression vs. network bandwidth limitations.